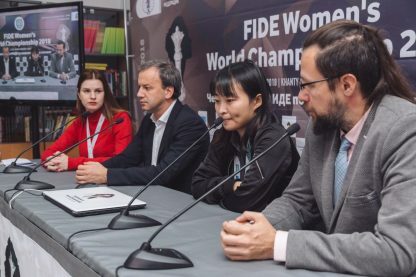 Press conference with the Women’s World Champion Ju Wenjun (China) and FIDE President Arkady Dvorkovich. 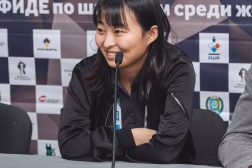 – Ju Wenjun, congratulations on defending the champion’s title! Please tell us about this long marathon. Are you happy with your playing here in Khanty-Mansiysk? – Thank you! Yes, I am. This is my fourth time in Khanty-Mansiysk. I love the city. And as for this marathon, I think I played very well. In the final, Kateryna Lagno played very solidly, she advanced in the second game. I was very lucky to I win the last game and then play tie-breaks. – Can we say that the final match was the toughest one for you? – Preparation takes a lot of time and it is very tough for me. But when I am playing I just think about chess. The situation for me was tough but I enjoyed my games, and that is the important thing. – Mr. Dvorkovich, you watched tie-breaks today. What are your impressions of it? 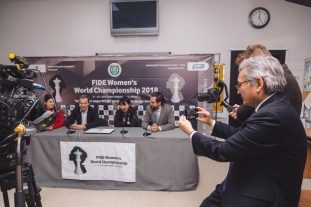 – We have just witnessed a unique moment in chess history when the world champion defended her title in the knock-out tournament. It’s quite rare event for the chess world. Ju Wenjun was playing amazing games even against one of the toughest opponents like Kateryna Lagno. And I was feeling the pressure that both competitors had on their shoulders and, of course, nerves played some role in this tie-break. Let me first congratulate all the participants of the Championship. I think all the ladies played very well and we enjoyed the tournament a lot. And of course I’d like to congratulate the three players – semi-finalists – who qualified for the Women’s Candidates Tournament next year. 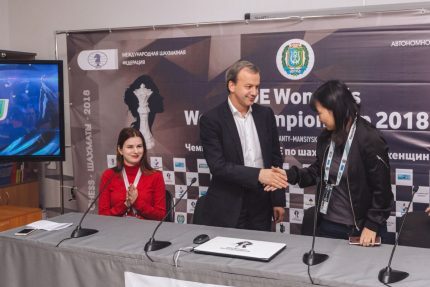 So we are expecting a very tough competition and I am sure that Ju Wenjun will be waiting for the new contender to come out of this Candidates tournament. And, of course, the most important congratulations are for the champion! Ju Wenjun, you’re a great player and a great champion. – Wenjun, what do you think about the organization of this event? – I am happy with the organization. Actually, Khanty-Mansiysk is my lucky place. In 2016, I played the Grand Prix series leg here and I became the challenger for the title. Now I have just won the World knock-out championship. – Two years ago, when you won the FIDE Grand Prix series here, you told us that you were going to spend your prize money just for a dinner with your friends. How are you going to spend your prize now? And how are you going to celebrate your victory? – Well, I still want to spend this for a dinner with my friends. Also I want to spend some money to keep training. But after this tournament I want to have some rest and just live for a while because it was tedious. – Mr. Dvorkovich, you have visited some events during this Championship. I would like to ask you about your impressions of the chess life in Ugra. 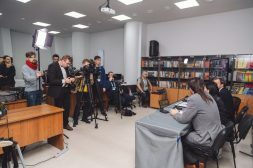 – Chess life in Ugra is very active and intensive, there are fewer and fewer blank spots with no chess in Ugra. Chess is almost everywhere. Today we visited the Ugra Governor Cup where hundreds of participants play and it’s very impressive. The organization of this event as well as organization of other high level events is very good and of a high quality. That’s why FIDE has been consistently giving the right to host tournaments to Ugra and Khanty-Mansisyk. We will witness a couple of more events in the upcoming years – the World Cup and World Chess Olympiad. 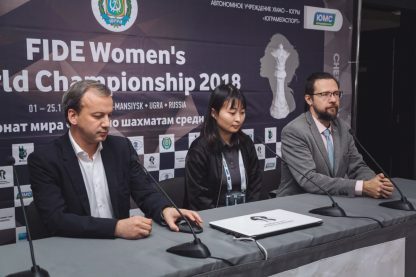 – Ju Wenjun during one of the press-conference told us that she was happy that the format of the Women’s World Championship would change so please tell us some details of this changes. – Changes have been announced already. 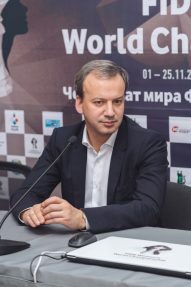 We are going to shift to a standard format that prevails in chess where the champion will defend the title against the winner of the Candidates Tournament that will be organized next year. 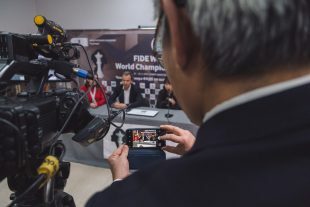 And in the future we will have both the FIDE Grand Prix series and the World Cup played according the knock-out system. A number of players qualified by rating and the best ones of the GP series and the World Cup will play in the Candidates tournament. That means that all the players who have already got their rights to participate in the knock-out tournament will keep their rights. There will be no harm for anyone while there will be clear benefits for high-level players.